One, a record setting future Hall Of Famer, the other, arguably the most versatile player this decade, and now both are unemployed. The parallels between newly released LaDanian Tomlinson and Brian Westbrook are eerily similar, fitting that they both will arrive in new cities for the first time in their careers. At the beginning of the 2010 football season, Westbrook and Tomlinson will have recently celebrated their 31st birthdays, will no longer be the focal point of an NFL offense, and be looking to prove the tank isn't on E just yet. As the San Diego Chargers have seen their future Hall of Famer decline for the third consecutive season since his mind numbing 2006 MVP season, the decision to seperate became more and more evident. As for LaDanian Tomlinson, his 9-year career in San Diego has literally been one for the record books. After nine seasons in the league, Tomlinson sits 3rd All-Time in career touchdowns (153) behind only Cowboy great Emmitt Smith (175), and legendary wideout Jerry Rice (208). The now former San Diego Charger whose career rushing total of 12,490 yards is good for 8th All-Time has recorded more rushing touchdowns (138) than any running back to play the game with the sole exception of Emmitt Smith (164). In Tomlinson's MVP year of 2006, he etched his name in the record books setting an NFL record with 28 rushing touchdowns in one season. However, that wasn't the first time Tomlinson was seen in historical fashion. Between 2004 and 2005, LaDanian Tomlinson recorded a rushing touchdown in 18 straight games, something no back had ever done previously. Throughout Tomlinson's time in SoCal, the Charger running back played in all 16 regular season games seven of nine seasons and rushed for over 1,000 yards in eight of those nine seasons, a true mark of consistency. Timeout: Back to that record setting 2006 season. LaDanian Tomlinson rushed for 1,815 yards, averaged 5.2 yards per carry, scored 28 rushing touchdowns, and that isn't all. LaDanian also hit the endzone with (3) three more receiving touchdowns to go with his 508 yards receiving. Impressed yet? With the emergence of the (2) running backs splitting carries on nearly every NFL franchise, LaDanian Tomlinson may just be the last Hall Of Fame back with numbers like this. The emergence of rookie running back LeSean McCoy in Philadelphia, and a concussion plagued season from veteran Brian Westbrook, Andy Reid and the Eagle offense has decided to part ways with the backbone of their attack for the better part of the past eight seasons. Westbrook doesn't have the statistics of the previously mentioned, however he's been just as important to his team, if not more so. In 2003, Westbrook's second season in the league, the Eagles realized how dangerous a player they had on their hands. A season which saw Philadelphia reach their third consecutive NFC Championship game also saw Westbrook rack up 1,251 all-purpose yards, and I mean all purpose. 306 return yards, 332 receiving, and 613 rushing yards, the Eagles had their weapon and would begin to use him any way they could. The following season, Brian Westbrook would once again cross the 1,000 total yards mark, increasing his rushing total to 812 and his receiving to 703. That season the Eagles would break through and finally reach the Super Bowl for the first time in four consecutive NFC Championship trys and they have Westbrook to thank for that. Playing without an injured Terrell Owens, Westbrook racked up 96 yards on 16 carries and caught five balls for nearly 40 yards as the Eagles handled the Falcons 27-10 and punched their ticket to the big dance. For the last eight seasons, Brian Westbrook has been as reliable as they come in the NFL. With 1,308 carries in his NFL career, Brain Westbrook has fumbled the ball just three times, for you mathematicians, that's one fumble every 436 carries. In 2006 and 2007, Westbrook all but carried the Eagle offense. A two year stretch where he recorded over 1,200 rushing yards each season and close to 700 yards receiving in both seasons as well. Timeout: Here's a player who has missed more than twenty games due to injury over his career, including eight this season with concussions, yet still has recorded close to 10,000 all-purpose yards. While McNabb & Owens feuded, while Andy Reid turned over the offense, who was the constant glue? Brian Westbrook. Brian Westbrook's career has been one marked by toughness and the ability to make an impact from anywhere he's lined up on the field. I still remember Westbrook on a breakaway run against the Cowboys with nothing but the endzone in front of him sliding down within the five to keep the Cowboy offense off the field in a close fourth quarter game several years back, sacrificing personal stats for a victory. How many players would do that? That's Brian Westbrook. 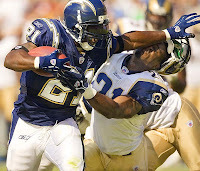 We've seen Jerry Rice in a Raider uniform, we've seen Montana in a Chiefs uniform, Emmitt Smith in a Cardinal uniform, and now we'll see Brian Westbrook and LaDanian Tomlinson dawn new colors in 2010, but never forget what they've been. Two of the more dominating figures in the NFL over the past ten seasons, two players who've carried franchises, and brought home hardware. For Tomlinson and Westbrook, they're departures are tough to handle for they're now former fan bases, but in the NFL, it's out with the old, in with the who?